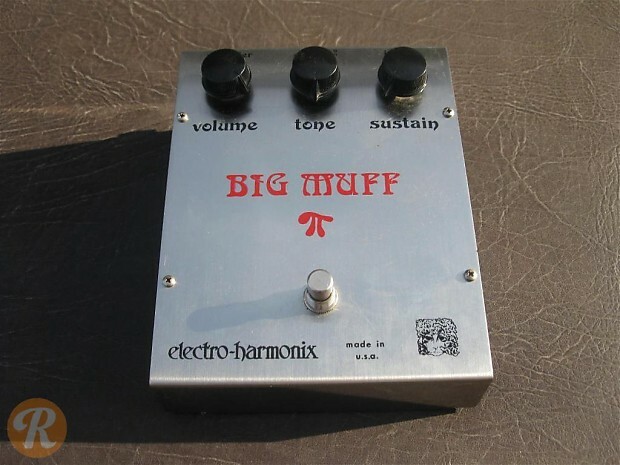 The Electro-Harmonix Big Muff Pi is one of the all time classic effects pedal. Introduced in the early '70s, the Big Muff Pi has undergone a number of cosmetic changes, but its circuitry and classic fuzz tone have remained largely the same. Original production ended in 1984 when Electro-Harmonix went out of business, though many clones and copies were produced by other companies. Production started up again in 1996, though the earliest Big Muffs are of the most interest to collectors. Even in the earliest era of Big Muffs, there was a good deal of variation in the chasis and design. Early '70s editions with the EHX Rams Head logo are among the most sought-after.